Out of Slovakia’s 9 national parks Slovak Paradise (or in Slovak: Slovensky Raj) definitely has the coolest name. 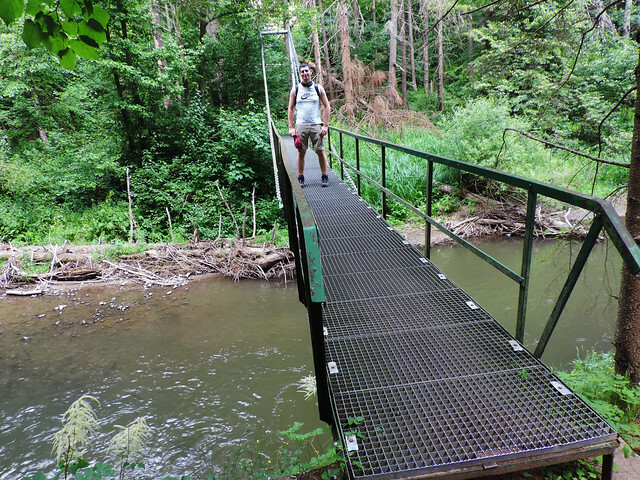 It would be hard to argue with this naming as this small park is a real paradise with its lush forests, wild creeks, adventurous ravines, glens and waterfalls. 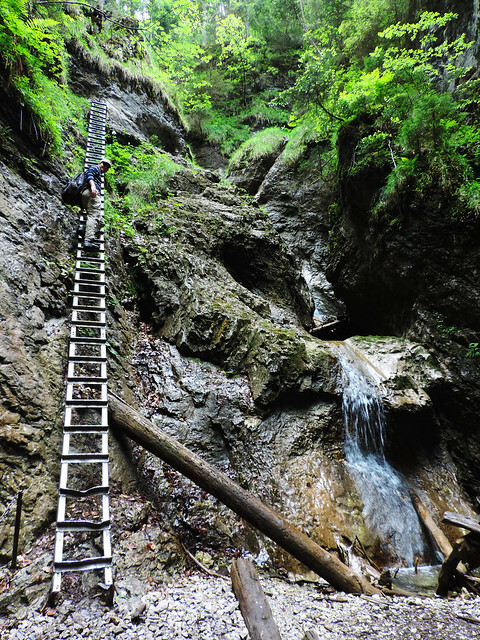 Could you see yourself climbing up to the top of a 70-something meters waterfall on series of ladders? Or walking in an ice tunnel? Or hunting waterfalls in charming glens? These are the main reasons Slovak Paradise has quickly became our little paradise. 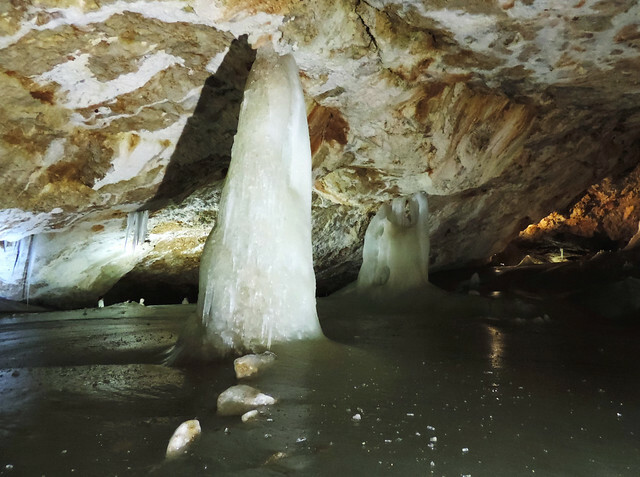 Not many ice caves in the world are located so low as Dobšinská Ice Cave in the Slovak Paradise. With the elevation of only 920 to 950 meters it’s still an icy wonderland all year! It belongs to the first electronically illuminated caves in Europe and it’s also a UNESCO World Heritage Site since 2000. Dobšinská is open to visitors roughly from the middle of May until October. You can explore it during a 30 minutes long guided walk. This was our first time in an ice cave! And walking in ice tunnels, and visiting ice halls was such a cool thing to do. Check out their official homepage for opening hours, prices and other useful details. 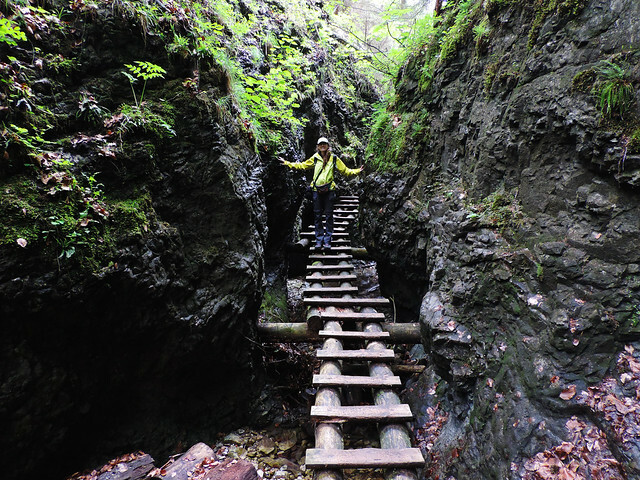 It’s one of the most popular ravines in the Slovak Paradise. Easily accessible, charming, adventurous and it only takes a couple of hours to do this loop. They say it’s busy, but when we arrived around 3 pm in the afternoon, and started the trail, we met only very few people. 😛 Guess we were late. Still we had plenty of time to enjoy this hike on that long summer day. The narrow gorge runs in a glen, and there are 4 lovely waterfalls on the way – the highest is 29.5 meters, and the smallest is 8 meters. There are ladders, platforms and iron steps built in the rocks, so that we can safely climb in the glen without any professional climbing equipment. Waterproof hiking boots are useful though, because of the countless creek crossings on the way. As in many European countries hiking trails are marked with colors in Slovakia. There are usually maps and signposts at the trailhead, and you should look for the color signs on the trees once you are on the trail. Signposts are often there to help you at crossings, but it’s always good to have a map with all the trails and their colors on it (at least, take a photo of the map at the trailhead with your phone). There is a small entrance fee to Slovak Paradise National Park (1.5 EUR/person at the time of our visit, 2018 May). It’s collected at some of the most popular trailheads. Most of the glen hikes are one-way: only up! This is to ensure safety, and there’s always an easy trail leading down outside of the glen. Our favorite online trailmap for Slovak Paradise is this one – actually, it’s our favorite trailmap for Eastern Europe. Hrabušice is a lovely village that’s close to most trailheads of the Paradise. Our favorite guest house to stay when visiting the park is there: Villa Mediasi. It offers nice, spacious, newly renovated rooms and a well-equipped, large, shared kitchen. To our pleasant surprise the staff speaks fluent English – that is not at all common at private guest houses in Slovakia. If you plan to drive through the park, and do some hiking in its southern area, Mlynky or Dedinky are nice choices. Last but not least: if you only visit the park as a day trip, Poprad is the closest major city that you can use as a base to explore the area. But it’s good to keep the general bear safety tips in mind. In a nutshell: make noise (talk loudly, sing, clap) to make your presence known; in case of an encounter, don’t ever turn your back to the bear, and try to leave the area slowly. You can check this for more details, but there’s tons of good advice out there on the internet about bear safety. Have you ever been to any of the Slovak national parks? Are they on your bucket list? Note: This post was originally published in 2016, and updated in August 2018. Is it possible to get to the park without a car and sleep somewhere close by? 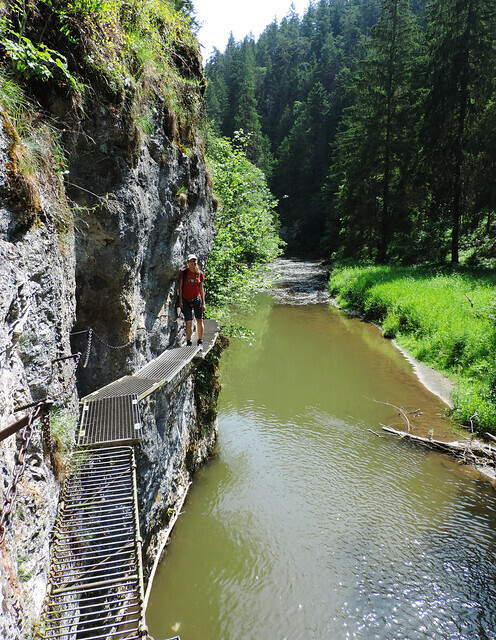 Different trails are reachable on foot from the small towns of Hrabusice or Pila, and some from Dedinky. We’ve seen bus stops, as well, so we guess there should be regular bus connection with larger cities (like Poprad), but we haven’t checked details about that, since we visited the park by car.